Shhh!! The cats are away! ;-) I think they delayed their departure thinking "someone" might be plotting something, so this note isn't on the usual email day. But I have a question for you. Can we hide over $120,000 of inventory in your stash? I promise to make it worth your while! How about 30% off! Does that entice you? Hey - you'll need some bezels to go with those stones. Bezels 30%! It might be a bit of a sticky wicket for me - so - Apoxie Clay and Crystal Clay - sticking to 30% off! How about some Swarovski flatbacks in fancy shapes, Not Hot-Fix, and, what the heck, Shapes in Hotfix too! What are they going to do? Chain me to my desk? You can stop that too. Chain 30% off! Or find some other ways to tie me down? Let's hide the Leather too! Maybe we should hide all the silk strings too! 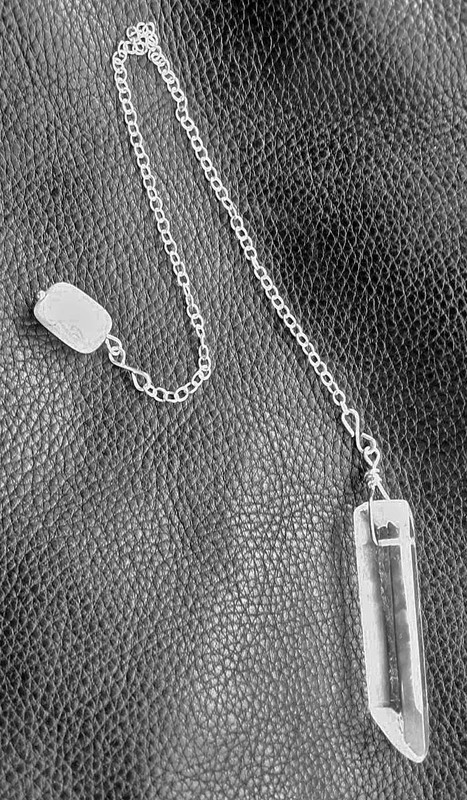 A long time ago while visiting Los Angeles I picked up a fabulous floating necklace that I still wear, years later. So when BeadFx started carrying Softflex solid coloured beading wire, l set about to make something similar to my beloved piece. I've always loved the Swarovski 'Copper Crystal' colour and because the jewellery gods were in alignment, it just so happens the new Softflex line includes a copper choice that is a perfect match. It also works with all of the BeadFx bright copper findings like crimps, beads and various closure options. So there lots of matching options if you want to switch out an element to your preference. 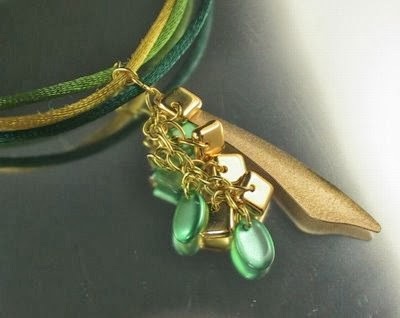 This necklace is a stunning holiday or New Years piece!! And if you happen to be a red head, you'll be the queen of the ball!! 1. This piece is three strands long. I used 14", 16" and 18" because I generally prefer longer necklaces. If you prefer something closer to the neck, adjust accordingly. Everybody is different. 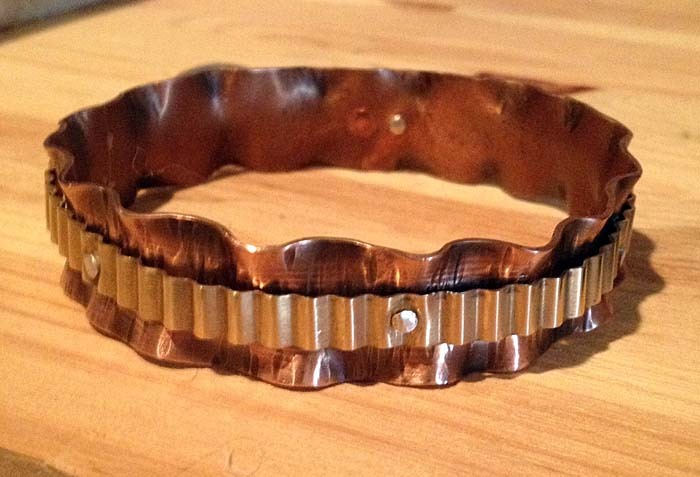 Crimp one end with a 2.5mm crimp in bright copper to one side and one ring of the 3-strand tube clasp in bright copper. Attach each length to the same side of the clasp. 2. For the two longer strands, I spaced out each grouping with approx 2" inches between. Lay the beading wire lengths out on your mat and using tape, mark where the groupings will be. Try to increment the groups so they lay in different spots when around the neck. 3. Once you've got your layout done, start adding the groupings. Start with a bright copper crimp, a copper 4mm metal bead, a 8mm crystal copper Swarovski stone, another copper metal bead, then another crimp. You can add crimp covers if so desired but I like the effect of the flattened metal crimp. 4. Once you get to the end of the two longer strands, loop and crimp them to the remaining empty slide clasp. 5. Now you'll finish the shortest length which is the closest to our face. I added a 12mm copper crystal this time to the middle as a focal point and spaced out the groupings. This particular piece has 4 groupings using the 6mm donuts instead of the 8mm, in addition to the main focal point crystal. Finish the end as you did with the other lengths. It's Etchy! It's Shiny! It's the Etchy and Shiny Show! some like it Spiky and Shiny! And Sew-on, and sew-on, and sew-on. I'd Love Knot to go there. I'd rather be dancin' in the Crystal Moonlight and hope that Momma don't take my Light Chrome away. Puns like this are going to get me band (around the sun). Check out all the new items here or click on a link above! Go forth and create and be happy! There's beading and then there's beading! Most of us start out learning the basics of stringing. Others start with bead weaving, loom, wire or metal work. There's nothing wrong with sticking with these options, but wouldn't it be fun to be a little more adventurous from time to time? Traditional peyote stitch (also known as the gourd stitch), is an off-loom weaving technique, and may be worked with either an even or odd number of beads per row. The free form version of this stitch is very organic, as it bends and even breaks many of the rules of traditionsl peyote stitch. 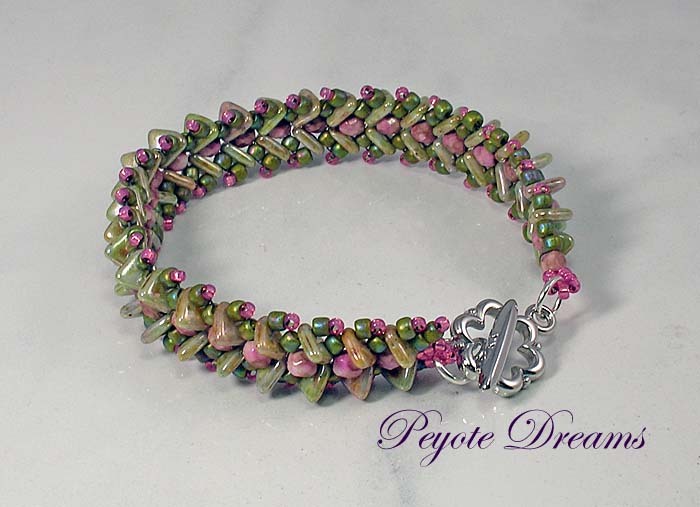 I fell in love with free form peyote many years ago, but did not even attempt it until I stumbled onto Karen Williams (Skunk Hills Studio) "Freeform Peyote Beading" group. I started my first project after purchasing Karen's book "Explorations in Freeform Peyote Beading". I was pleased when my first attempt turned into a glorious bracelet! Although it was easier than I anticipated, I didn't end up working on another project until I decided to play with beaded beads. Five beads and one workshop later, I'm still addicted to the process! An interesting side note is that I won the grand prize, in Karen's book launch giveaway! A fabulous cabochon, plus enough beads to make my own free form necklace. 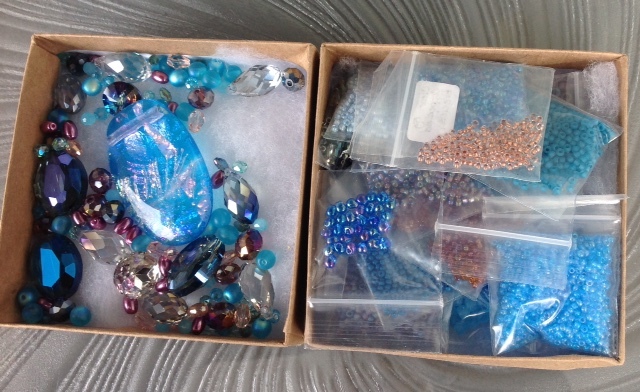 Guess who hasn't even started the necklace yet(and how did she know that I love blues?)? Intuitive bead embroidery is a rather untamed version of traditional bead embroidery. It's like colouring outside of the lines, and I wouldn't have it any other way! 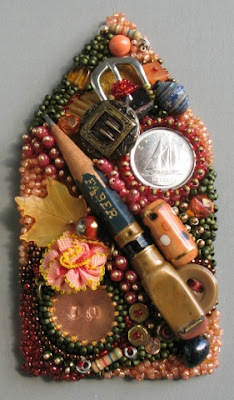 I picked up tips by participating in Robin Atkins' Bead Journal Project, but then made it my own when I started including non-traditional objects in my work. The stitches are similar, but it's how you use them that really counts! Another author that you might like to take a look at is Diane Hyde. Although I'm not personally attracted to her work, it's original and certainly contains food for thought! Especially her use of doll heads! Years ago, I purchased a small bag of red paper beads that were made in Africa. I loved them so much, that they've never been used! That spurred me into researching the process, attempting my own version, and then developing a workshop. 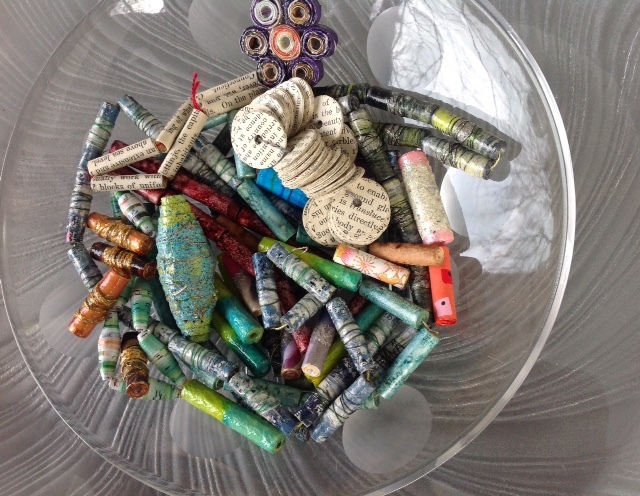 Paper beads can be made in all shapes and sizes, and they're great for recyling all sorts of bits and pieces! Why don't you give them a try? Don't be afraid to take a walk on the "wild side". A little creative play is always good for the soul! 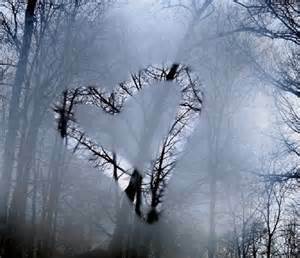 February has some well-known observances and events including Valentine's Day, Groundhog Day, and the Super Bowl. It is also the month that, while the shortest, feels like it will go on forever! Not to worry - bundle up and come out for a class or two and be with other like-minded jewellery-making enthusiasts while you learn a new technique. 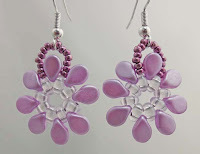 Our intrepid and creative instructors are offering classes that cover a wide range of jewellery-making techniques. 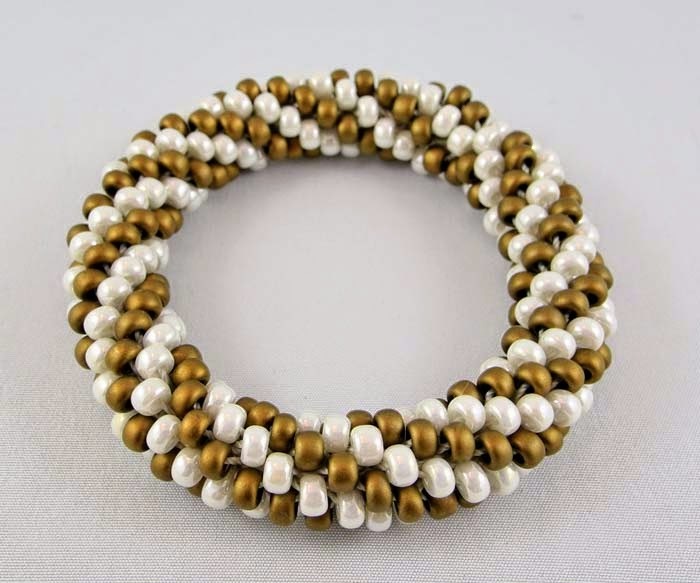 New this month is a St. Petersburg Chain bracelet with Pamela Kearns that uses 2-hole beads. 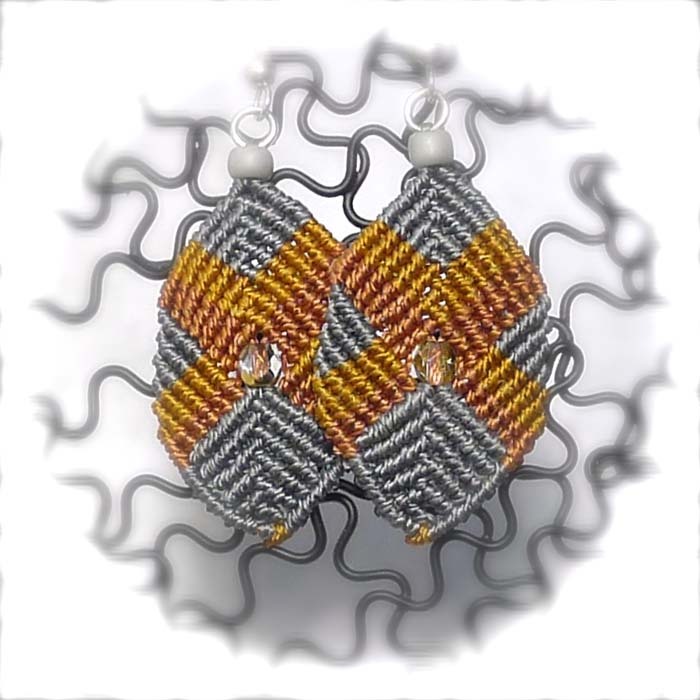 Angela Peace is teaching a new micro-knotted earring design. 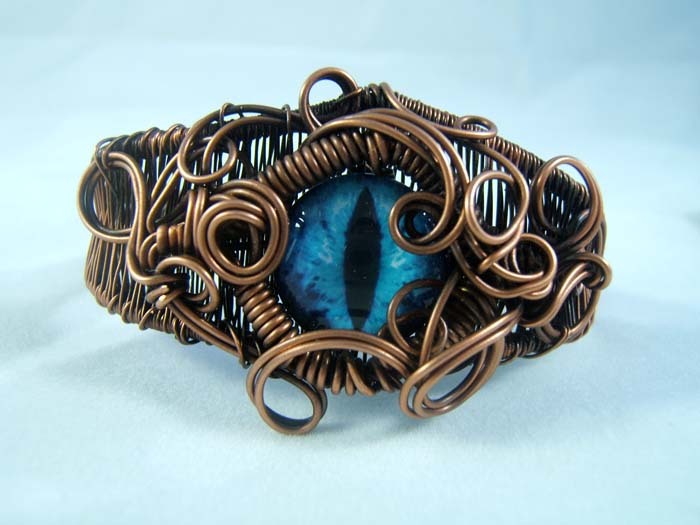 Of course we have lots of encore classes including Iris Rogers Melamed's Ruffled Bracelet, Bonni Poch's Crochet 101 and Jen Rosen's Dragon's Eye Bracelet. Complete information about each class, including course descriptions and applicable fees, is on our website. Click on 'Classes' and follow the links to the February calendar. InspirationFX: "Leaf" My Leftovers Alone! 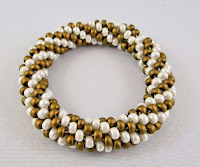 A sweet, little floating wrap bracelet, made with leftover pearls, from my "Rosaline's Journey" necklace. The pearls were paired with sterling rounds, a single leaf, and then finished it off with a sparkling clasp. Light, lovely and simple in design, yet incredibly fast and easy to construct! - Wrap beading wire, around your wrist, twice (but not too tight). Remember to leave a little extra room for the loops, and don't forget that you will be adding a clasp. - Add a large crimp to one end of the beading wire. - Loop the beading wire around one end of clasp (the side with the crystal), then through crimp again (making a comfortable loop, approximately 1/4 " in length, and leaving one end, slightly longer). - Squeeze the crimp gently, with the tip of your needle nose pliers. - Check to make sure the wire loop is secure, then trim the loose end of the wire. - Add a crimp cover, over the flattened crimp, and then squeeze gently with your needle nose pliers. Note: You will need to flatten each of the small crimps (size 0) gently, with your needle nose pliers. 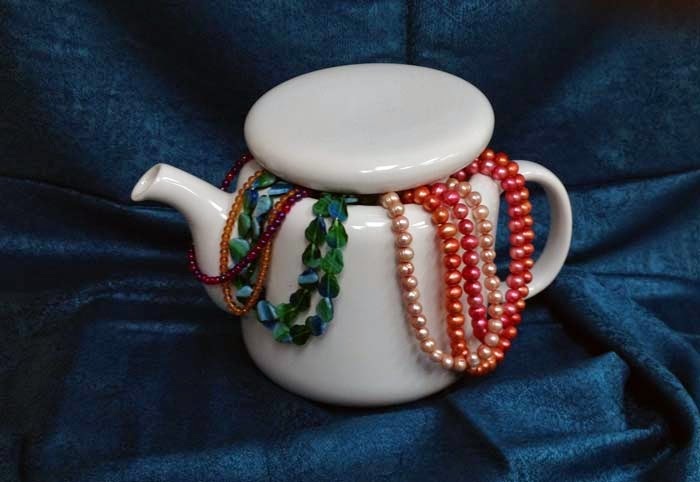 Leave enough room on either side of the crimps, to allow the rounds and pearls to float and move. Make sure that the crimps are secure. - Add a large crimp to the remaining end of the beading wire. - Loop the beading wire around one end of clasp (the side without the crystal), then through crimp again (making a comfortable loop, approximately 1/4 " in length, and leaving one end, slightly longer). Enjoy wearing or gifting your bracelet! If you're making jewellery, chances are you also have a stash of wool at the end of your couch and you knit at night while the TV flickers in the background. Those of us drawn to create, design and make are rarely limited to one medium: or, if we are, we've probably gone through several other crafts before settling on our most satisfying creative outlet. At any given time I have: wool and needles for working on a small project close at hand (I need to get better before I tackle something bigger since I just recently taught my leftie self how to knit), my design notebook beside me with coloured pens, and my bead board with a project on the go. When I'm soldering or forging metal, I'm also thinking about felting and how I might combine hard, shiny metal with the softness of felt. Sometimes I think maybe I have creative ADD but I'm coming to the conclusion that I'm just a lifelong onmicrafter. On the weekend I was watching a Periscope with my friend Kate Richbourg, who was attending a Craftsy instructor summit. She, and a couple of other teachers, were discussing how most creative people are omnicrafters and how they use learning a new craft as a boost of creative energy across all their work. There are a couple of definitions for onmicrafter out there on the Internet. One calls an onmicrafter someone who does many crafts all at the same time. Another definition suggests an omnicrafter as someone who creates work using a variety of techniques and materials. I think I'm both! 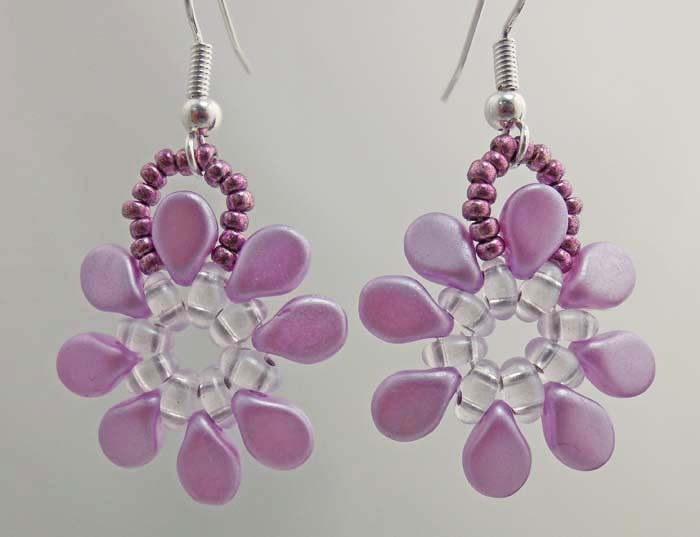 Broadens your creative outlook - there's more to jewellery than just beads! This handbag I made last year benefitted from my omnicrafter tendencies. 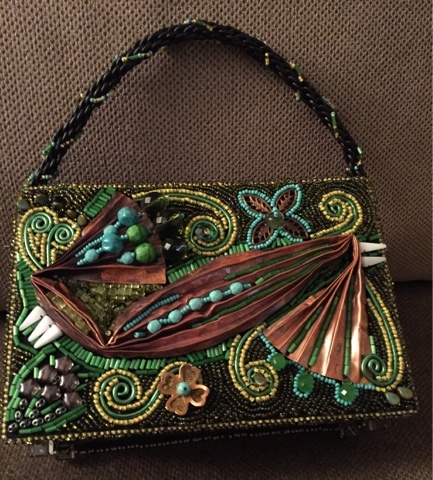 It includes metalwork, resin, bead embroidery, kumihimo, painting. So learn a new craft to add to your creative arsenal. Learn how to quilt then bead embroider it. Learn how to do needlework and add beads to a sampler. 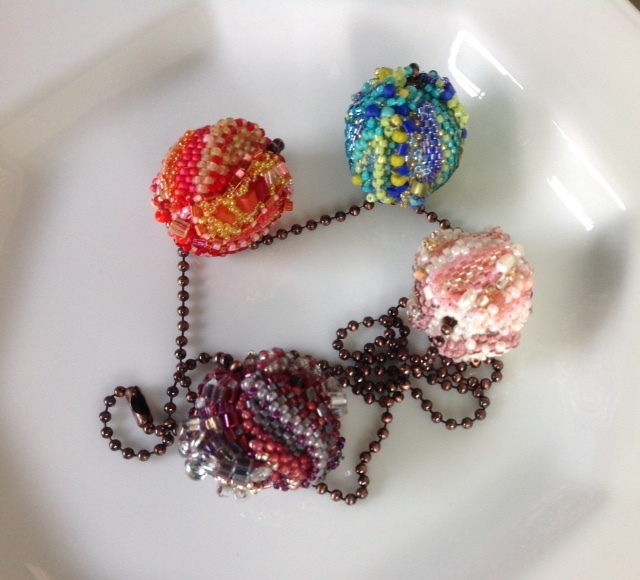 Learn how to knit then add beads to your scarves or ribbon embroidery or both! Learn how to make paper then bind it into books and embellish the covers. Crochet thread or wire and add beads. Sew metal to leather. Solder metal then glue it to canvas. 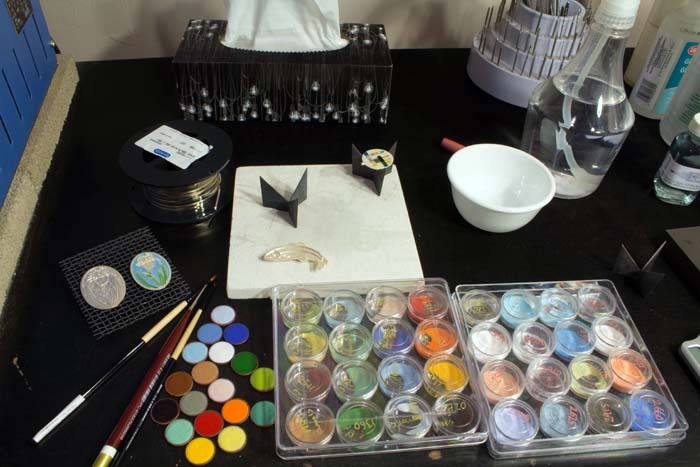 Make an encaustic painting and crust it with beads. The creative horizon is endless and full of creative opportunities. Happy exploring. Quick note - I hope to be writing to you next week from Tucson. I'll Periscope some of the new and exciting products I come across. Download the Periscope app now and you won't miss out on the fun. Once upon a time, there was a pendant leaf called Rosaline. She was buried,in the depths of the BeadFX cupboards, but yearned for just one chance, to dance in the light! She escaped from the dungeon, only to find herself incarcerated on the sale rack! Sure, she was able to hang about, making a few new friends, but still it wasn't enough for this ambitious soul! She was sad,that no one was aware of her true potential, so she set out on her journey again. Finally, I spotted her, and stopped in my tracks! I was so impressed, that I decided to throw a celebration, to explore her potential. Rosaline was ecstatic, and now there's no stopping her! Rosaline is a bit of a fickle leaf! She shows as blue on dark colours, but reverts to pink, on pale ones. This necklace is full of all things pink and delicious! Crystal, pearls, and chain, mixed in with a little dark, to cut the sweetness! 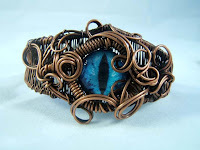 A great project to practice your wire wrapped loops! Not a lot of planning was involved, just a pile of components, that I fiddled around with, until I was happy! For me, the materials provide the inspiration. I start with just one thing (this time,Rosaline), and then just follow my muse! Depending on your design decisions, more or less components could be used in this project. Attach a Pinch Bail to the Rosaline Leaf, and then to the chain. Start in the middle, and then space the remaining leaves, equal links apart. I spaced them on every other, textured link. If you have links remaining, they can be used in future projects. Components: - Please note, each link, consists of either pearl(s), pearls +filigree bead, or a single filigree bead. They are joined together with wire wrapped loops. -Chain end/3-pearl link/3-pearl link/1-filagree bead link/2-pearllink/3-pearl link/1-pearl link/2-pearl link/3-pearl link/2 jump rings, joined to the ring on one end of the clasp. 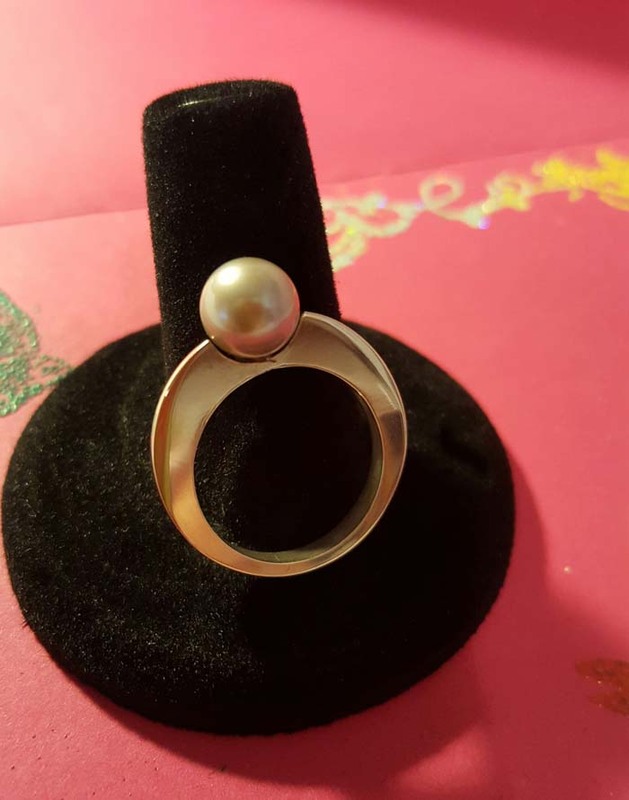 -Chain end/filigree bead, pearl, filigree bead link/1-pearl link/3-pearllink/2-pearl link/3-pearl link/2-pearl link/1-pearl link/3-pearl link/2 jumprings, joined to the ring on one end of the clasp. If Pink, just isn't your thing, the Swarovski Pendant Leaf, is also available in Bordeaux and Gold Teak. Even better, they're presently listed at 50% off! Let the journey continue! There's nothing wrong with your beady status quo! No time for a full class?How about a mini-class!